Play as Waltynn, a waffle from the planet Hekta who lost control of his spaceship and crashed on the planet Lylo. Help him survive and escape the planet. As you explore the planet, you realize that you've landed right in the middle of a Apocalypse. If you like the soundtrack of BreakFest, we uploaded the full soundtrack on YouTube! BreakFest Is Now Available On Steam! 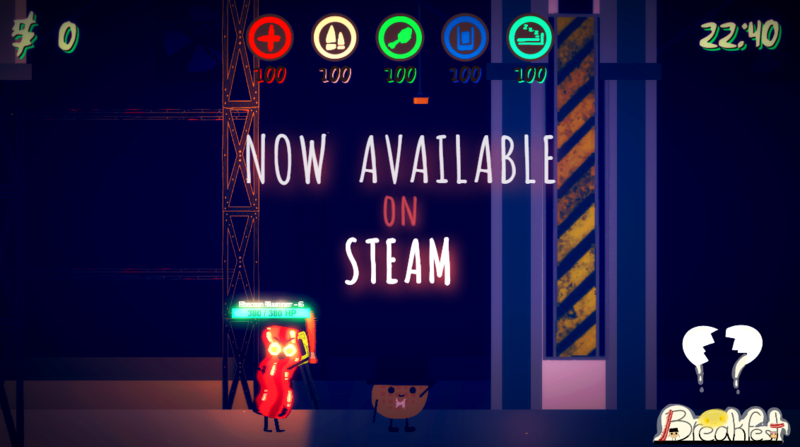 We are thrilled to announced that BreakFest is now available to purchase on Steam! Plus there is a 10% release discount on now for a week! So what are you waiting for? There are Bacons needing to be dealt with! We hope you enjoy playing BreakFest and don't forget to share the game if you like it! 附注事项: The game will still work with lower system requirements but it will have less FPS.